Diamonds were created by nature in a multitude of colours. Coloured diamonds are known in the jewellery trade as “fancy diamonds”. Natural fancy diamonds can be very, very expensive, depending on their colour. 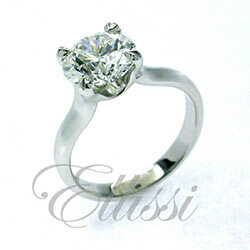 Diamonds that have been colour treated do not command the same price level as naturally occuring coloured stones. Fancy diamonds fall into six main colour categories: yellow; green; blue/grey/violet; orange/brown; red/pink/purple and a general category called “other” that includes black and other unusual colours that do not fall within the main categories. Did you know that there are over 300 recognised shades of colour in diamonds! The reason that we see colour in fancy diamonds is (for most coloured diamonds) caused by a disruption of the atomic structure of the diamond. This means that the diamond absorbs more of a particular light colour at one end of the spectrum, and transmits more of another colour. This is known as “selective absorption of light”. So for example, a diamond that absorbs more blue portions of white light will appear to the eye as yellow. 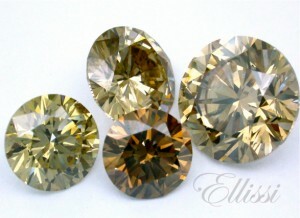 The beauty of the orange/brown category of diamonds can be seen here with these cognac and champagne colours. These are produced in quite large quantities here in Australia in our famous Argyle mine. Click on the following link for more information on champagne and cognac diamonds. A Radiant cut diamond is photographed here on top of its GIA certificate. The GIA has graded the diamond as being a natural (not colour treated) “Fancy Intense Yellow”. The most intense yellow on the GIA scale is “Fancy Vivid Yellow”. Fancy Intense Yellow is the next level down on the scale. Yellow diamonds are usually cut in radiant or cushion cut shapes, as this shape accentuates the yellow tone of the diamond. Click on the following link for more information about yellow diamonds. Pink diamonds are quite rare and very, very expensive. The Argyle mine in Australia is famous for its pink diamonds. It is said that the Argyle mine’s supply of pink diamonds is diminishing. This will only increase the value of pink diamonds over time. Click on the following link for more information about pink diamonds. Green diamonds are amongst the rarest of all the coloured diamonds, with only a few released for sale each year. As with all coloured stones, the depth of colour varies from diamond to diamond. Natural green diamonds can range from a light mint colour right through to a bright grassy green colour. As with most coloured diamonds, the more vivid the colour, the rarer the diamond and the greater its value. Green diamonds are unique in that their colour stems from their exposure in the earth’s surface to naturally occurring radiation.